MRF's K M Mammen, JK Tyre's Dr Raghupati Singhania, NITI Aayog's Amitabh Kant and Ceat's Anant Goenka. 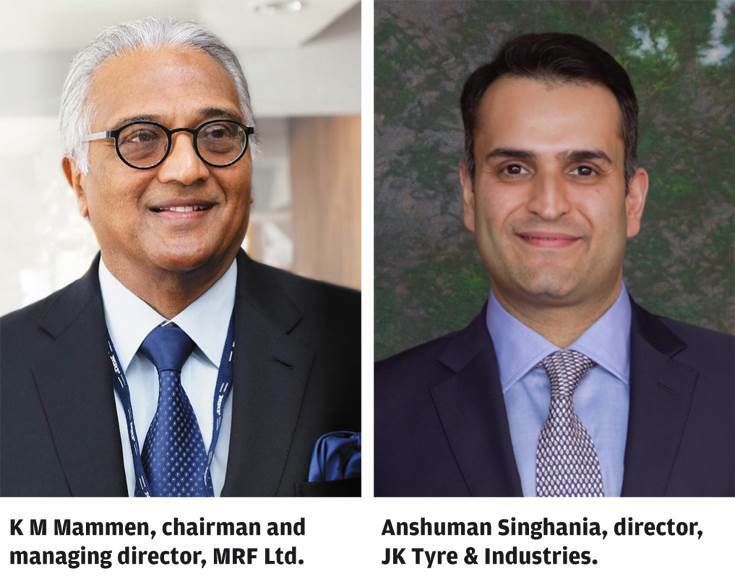 K M Mammen, chairman and MD, MRF Ltd, and ATMA’s new chairman, welcoming Vikram S Kirloskar, president, ARAI and vice-chairman, Toyota Kirloskar Motor. Anuj Kathuria, president, Global Trucks, Ashok Leyland, presented a keynote on the emerging scenario in India’s commercial vehicle segment. CV industry panel comprised (L-R) Apollo Tyres’ Satish Sharma, Tata Motors’ Rajesh Kaul, Ashok Leyland’s Suvendu Moitra, VECV’s Pradeep Mishra, JK Tyres’ Rajiv Prasad and E&Y’s Rakesh Batra. The PV panel discussion had L-R: MRF’s Koshy Varghese, Maruti Suzuki’s Deepak Sawkar, BTVi’s Chanchal Chauhan, Honda’s Abhishek Sahi, Bridgestone India’s Parag Satpute, and PwC’s Kavan Mukhtyar. Apollo Tyres’ Satish Sharma felicitating Anil Srivastava, Adviser (Infrastructure Connectivity) & DG-DMEO, NITI Aayog. MRF's Koshy Varghese felicitating Ashok leyland's Anuj Kathuria. TVS Tyres' P Vijayaraghavan felicitating ICRA's Shamsher Dewan. L-R: Ceat’s Nitish Bajaj, Hero MotoCorp’s Deepak Manchanda, Bajaj Auto’s Rahul A. Karambelkar, Hero MotoCorp’s Ashok Goel, TVS Tyres’ P Vijayaraghavan, and ICRA’s Shamsher Dewan. Bridgestone India’s Parag Satpute felicitating Honda’s Abhishek Sahi. JK Tyres & Industries' VK Misra delivered the closing remarks at the ATMA Convention. Tyre safety awards were presented to stakeholders who have helped the tyre industry in spreading the message of tyre safety. Seen here are representative of RSDC with the award. Anuj Kathuria, president, Global Trucks, Ashok Leyland presented a keynote on the emerging scenario in commercial vehicle segment. Rakesh Batra, Partner & National Leader - Automotive Sector, E&Y and Rajiv Budhraja, director general, ATMA presented an overview of the auto and tyre sectors respectively.